You can now view your Ricoh Theta V (reviewed here) 360 photos and videos wirelessly in VR using a Playstation VR (reviewed here) or Oculus Go (reviewed here). 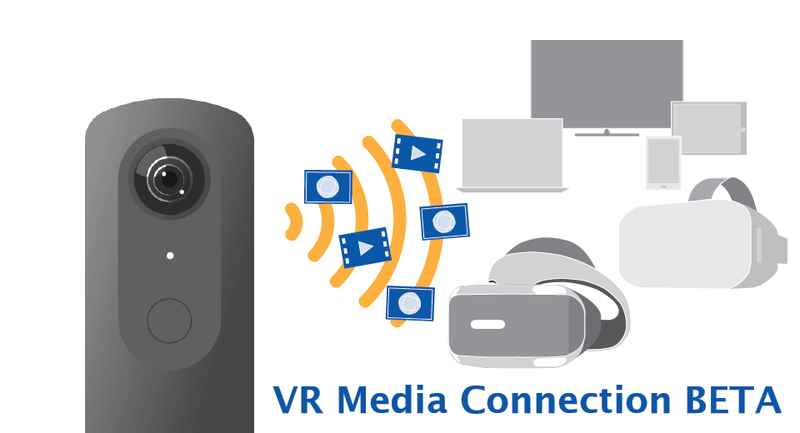 The new VR viewing capability was made possible with a new Theta V plugin called VR Media Connection. This feature could come handy not just for sharing your photos and videos more quickly, but could also be useful for virtual tours. Get the plugin here. You can install it with the desktop app. After installing the plugin, there are two ways to use the plugin: the AP mode and the Client mode. For Oculus Go, you can use either mode. For Playstation VR, you need to use the Client mode. For AP mode, you simply connect your Oculus Go to the Theta V’s wireless signal the same way you would a wireless network. Remember that the default password is the serial number of the Theta V printed on its base, including the leading zeroes. Once connected, activate the plugin by holding down the mode button for 2 seconds until the Theta’s LED light turns white. Theta V’s photos and videos will appear in the Oculus Go’s Gallery app. 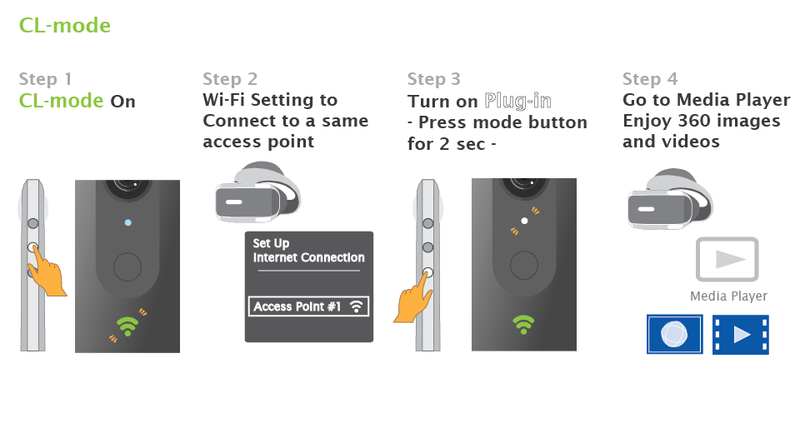 For Client mode, the Theta V and the VR headset must be connected to the same wireless network, such as your home network. 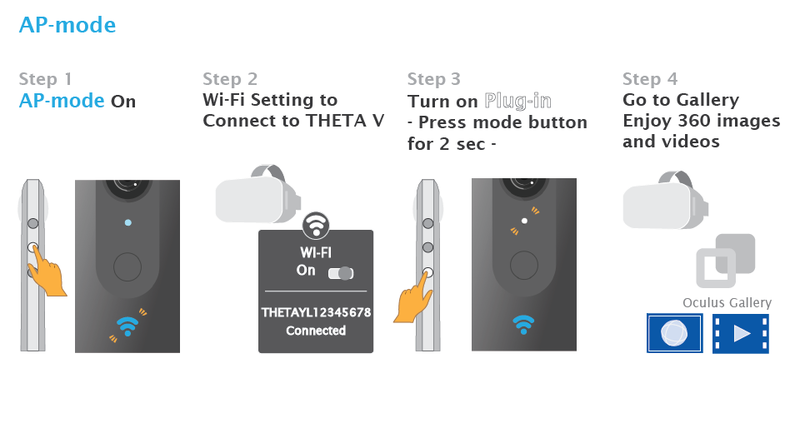 To connect the Theta V to a wireless network, use the Theta app. After both the Theta V and VR headset are connected to the network, activate the plugin by holding down the mode button for 2 seconds until the Theta’s LED light turns white. Theta V’s photos and videos will appear in the Playstation VR’s Media Player app, or the Oculus Go’s Gallery app, as the case may be. Thanks to Theta Unofficial Guide for sharing the news! This is a cool plug-in. I tested it with Sony Playstation VR. It’s pretty cool to see your own pictures in the headset and be completely inside them. It’s easy to go out, take photos, and come back and view them immediately. Instead of viewing things that others have made, it’s your own content. If anyone else is testing, I’d be interested in hearing your experience. This is a beta version of the plug-in and RICOH is collecting feedback. Great info, Mic. It’s interesting to see what 360 cameras are capable of. Exciting improvements happening regularly.